Thanks to your support, the World Vets textbook drive was a success! 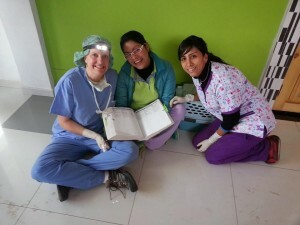 A variety of veterinary textbooks have been collected and distributed benefiting both veterinarians and veterinary students in multiple countries around the globe. 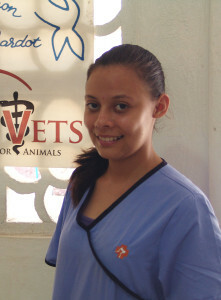 The World Vets Latin America Veterinary Training Center, located in Granada, Nicaragua, now has a free access bookshelf available to Latin American vets and students visiting our training center for free surgical instruction. This provides a variety of materials to those who would otherwise have no access to these types of resources. 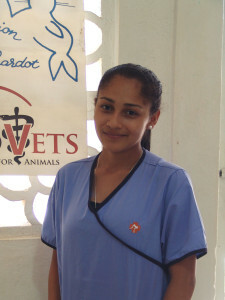 Most of the veterinary students in Nicaragua do not have access to any textbooks, so this is a great resource. Collected textbooks were also distributed to communities in the Marshall Islands, Solomon Islands and Kiribati during the 2013 Pacific Partnership Mission. Left to Right – Prof. Adil Suliman, Prof. Abal Wahab, Dr.Rasha Nouman and Dr.Abbas. 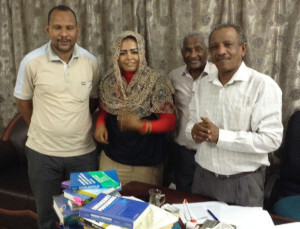 Most recently, World Vets was able to help provide veterinary textbooks to Bahri University in Sudan. A special thanks to Dr. Rasha Nouman for hand delivering the textbooks. 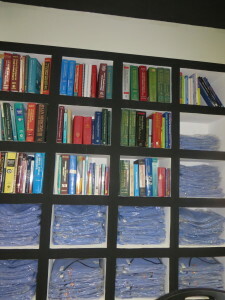 It was reported that these books have been a great addition to the university’s small library. Books that were distributed through the textbook drive not only cover a wide range of veterinary subjects, but they also contain up to date and reliable veterinary information and training methods. Access to these textbooks allow readers the opportunity to gain a better understanding of safe and effective veterinary practices, encouraging a healthier and more sustainable community for their future. 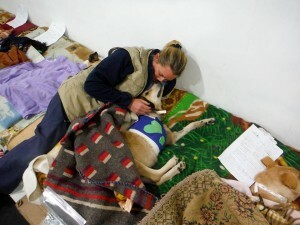 None of this would be possible without the help of World Vets donors. We can not thank you enough for your support! World Vets is still collecting monetary donations to help cover the shipping costs for us to send additional veterinary textbooks to those in need. 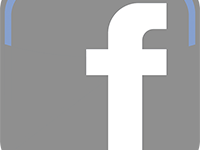 If you would like to help, please click HERE. 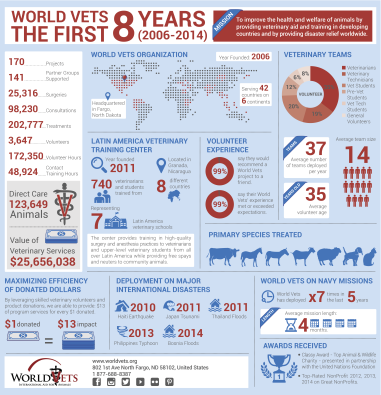 World Vets: The First 8 Years! Eight years ago, World Vets got started from an idea and a donation jar. With programs in 42 countries on 6 continents, we have now provided over $25 million worth of veterinary services to animals that would otherwise not have access to care. We rely on your generous donations to bring care to the animals most in need. Please see our `help`tab on the main menu to see all the ways you can contribute. 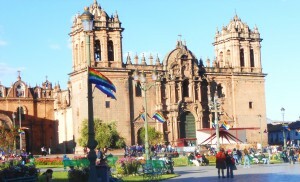 Cusco, the historic capital of the Inca Empire, is located in the Peruvian Andes. 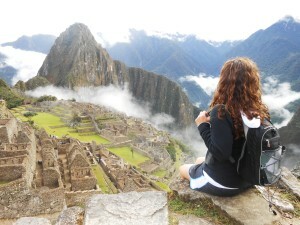 It is also the jumping off point to the famous Machu Picchu ruins. Since 2011, World Vets has been providing large scale spay/neuter campaigns benefiting animals in three distinct districts of Cusco. In the last three years, we have also established agreements within these districts which stipulate that municipal sponsored poisoning campaigns would cease in their area in exchange for free spay/neuter services. Consequently, our Cusco small animal project has acted to limit such poisoning campaigns. 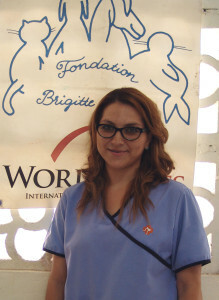 World Vets will return to Peru September 30 – October 7, 2014 to provide a large-scale spay/neuter campaign, in addition to preventative health treatments. The team may also perform any other surgical procedures needed on a case-by-case basis and provide a small number of health consultations. This campaign will also celebrate World Animal Day (Oct 4). We are seeking veterinary technicians (licensed and non-licensed) as well as students and assistants (no previous experience required) to complete our team. If you speak Spanish and/or have Spanish speaking skills, this would be a great opportunity for you to utilize and/or practice your language skills. 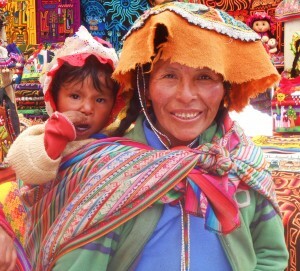 Volunteers will have free time to enjoy local and/or national sights such as the famous Machu Picchu ruins and other Inca sites as well as visit handicraft and artisan markets.